Libraries have been preserving the world’s knowledge for centuries, but recently they have had to deal with a new class of threats–how to preserve the vast stores of digital information that they collect. While books on paper are susceptible to pests, fire, water, and other hazards, digital materials are at risk for those and many other reasons. Digital resources in the library run the gamut from databases to images to audio files. In some cases we rely on a commercial entity to provide preservation services, but libraries must also preserve the large number of materials digitized from their collections. If you are interested in a brief overview of the world of digital preservation, take a look at this tutorial from the Cornell University library. While digital materials are vulnerable to the same physical threats as paper, they are also threatened by obsolescence of the storage media and programs used to access data files. 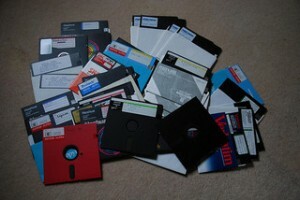 For example, most students today still remember 3.5″ floppy discs, but how many know that data was once stored on 8″ discs! Finding equipment to read older digital media is just part of the problem. File formats, program files, and operating systems are constantly changing, and they are often not backward compatible more than a couple of versions. Preserving digital resources is a daunting task, but libraries and archives are staying on top of the game. National preservation programs at the Library of Congress and library consortia such as the Academic Preservation Trust (of which Hopkins is a participant) are finding ways to provide efficient and effective preservation methods to unique library resources. And libraries are also working with publishers in programs such as LOCKSS (Lots of Copies Keep Stuff Safe) to make sure that journals and other commercial digital content remains available to future generations of scholars. Digital preservation is not just a problem for libraries and archives–you probably have many audio files, pictures, and digital documents on your home computer. To get ideas about preserving your own collection, visit the Library of Congresses personal digital archiving site and follow this digital preservation blog. Celebrate Asian Pacific American Heritage Month!